This wolf wasn't hunting, but saving him. Riley Clarke was born and raised in a small Canadian community in the heart of Labrador. Craving more than what the town could offer, he left for three years only to find himself drawn back to the wilderness. It's not easy being openly gay here. As loneliness creeps in, he takes a camping trip to gather his thoughts. Little does he know that one trip could change his life forever. In the wilderness, there are more dangers than bears and mosquitos. One man can't always withstand nature's fury. 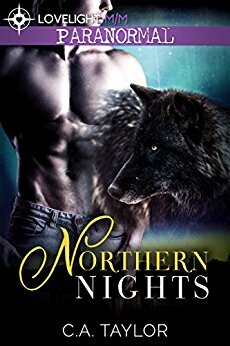 Werewolf Landon Snow, abandoned by his pack, is searching for his one true mate in all the wrong places. He struggles to find love in a place where people like him live deep in the closet. A new job out of town threatens to make his quest for love even more difficult. He blows off steam by running wild in the great outdoors. He loves transforming into his wolf form to escape, if only briefly. When he discovers a human in trouble -- and not just any human, but the one he's had his eye on for months -- he has no choice but to intervene, whatever the cost. These two rugged men take their turns saving and being saved in the Labradorian wilderness after crossing paths in a fateful encounter. As they explore untouched land together, the fire between them grows. Riley struggles to accept that Landon is paranormal, and they both know that their relationship will be risky in their hometown. When a freak blizzard hits, it's time to decide: can their flame glow bright enough in the northern night to find their way home... and into each other's arms?